Sure beats burying or cremating the horse—sort of a giving back, a recycling kind of thing. It wouldn’t worry me aesthetically; but I would draw the line at monkey (although I think I’ve had it, many years ago) and people-burgers are definitely off my list* . Soylent Green too … good lick with the experiments. * But we never actually know, do we? Mislabel a horse, why not … anyone still a ‘missing person’ in the UK? 1st of all, thank you for following my blog: Goddess on the Go! 2nd: I never thought I would eat horse meat. However, when I chose to go to Kenya, Africa for 31 days in college, I had to transition back to an omnivore after being a vegetarian for a couple years, and promise to eat whatever was served to me. One of the last nights we ate at this restaurant in Nairobi called, “Carnivore.” The catch of the day included zebra, and to this day, it was the most delicious, melt-in-your-mouth red meat I have ever had in my life, and that was nearly 20 years ago! Hi there, we made a horse burger from scratch and it was truly good. A very lean and slightly sweet meat. The article is in german but you might enjoy the pictures! You should come to France – they sell it openly in Carrefour, the local supermarket chain. 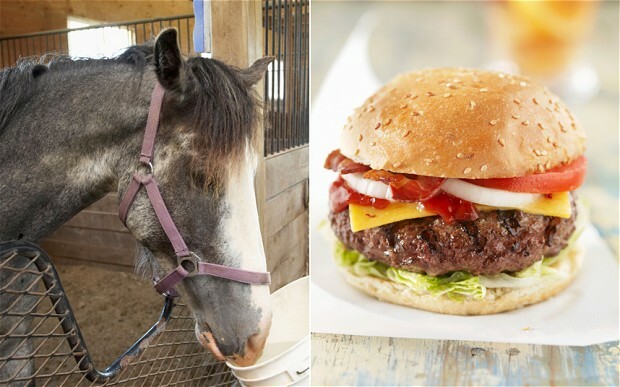 I just can’t imagine eating horse meet. I do not eat much red meat anyway. It isn’t as good for you as white meat and seafood. Hi, Joe–and thank you for following my myth/hiking/poetry blog! Your post on horse meat is thought-provoking. One reason consuming it may be problematic is that at least in the U.S., racehorses (which make up a large percentage of the horses sent to slaughter) are routinely dosed with the anti-inflammatory drug phenylbutazone (“bute”), which is kidney-toxic in humans. I suppose food-safety agencies need to sort out how to test and regulate for this issue if horse meat is to become a significant food source for people (instead of for cats and dogs). I may be posting a few photos this month of my own horse, Rose. She’s not for sale. I remember on my study abroad several years ago, a friend of mine from Italy said he had had horse steak in a restaurant back home in Milan. I know they don’t slaughter horse for food here- my old college town shut down a slaughterhouse that did as soon as the law was passed. I would imagine that Genie is right- most non-beef red meat tastes like lean beef. Most animals other than cow don’t get all fattened up before processing. I saw that you read my venison roast post, but it goes for all the cuts we got from our deer. Elk, bison, antelope, and big horn sheep are the same I’m told. Even wild bear is supposed to be quite lean. I want to get something else too but can’t decide between Zebra or camel.. I shall come back to see what your verdict on the horse is..
That’s a great site. Thanks for the resource. I think I may have to work my way through the whole list! My vote would be for Zebra. Don’t ask me why, I just think it’ll be a really nice meat. I’ll be waiting to see which you choice though and how you get on. Wow! Never thought to eating it raw but I think I may be adventurous enough to at least try a bite or two with soy sauce. Thanks for the recommendation. I’ll let you know how I get on. I think I’ve tried horse before. If it was horse, I remember it just tasting like a very lean beef. How do you think you will cook it? After your meat arrives, I’d love to invite you to a link party called Our Growing Edge. Our Growing Edge is about new food experiences, especially foodie bucket lists. The event aims to compile a monthly snapshot of new foodie experiences and aims to connect and inspire us to try new things. A “growing edge” is the part of us that is still learning and experimenting. It’s the part that you regularly grow and improve, be it from real passion or a conscious effort. Thanks for the invitation to the Growing Edge. It looks like a great idea and would definitely be interested in taking part. I’ve heard the same about it being just like lean beef but I’ll have to wait and see. I’m not entirely sure how I’m going to cook it yet but I have been recommended to try it raw with soy sauce. A popular southern Japanese dish, apparently.